The six parts of Bach’s Christmas Oratorio, performed Saturday evening by the singers and players of Emmanuel Music, celebrate the joyous events surrounding Christmas and the New Year: the birth of Jesus; the singing of the angels; the worship of the shepherds; the naming of the child; the coming of the Wise Men from the East; and the defeat of King Herod and the forces of evil. Unlike the regular Sunday cantatas, whose shorter texts were arranged in the form of a sermon that explained the readings for the day and applied their theological message to Christian life, the works designated by Bach as “oratorios” for Christmas, Easter, and Ascension Day belong to the historia tradition of Protestant Germany. Their devotional texts were based on biblical stories but — in contrast to contemporary opera librettos — largely avoided any exchange of dramatic dialogue. Like the St. Matthew Passion, these oratorios often feature recitative texts of a contemplative type inserted between the Evangelist’s narration and an aria in a sequence that usually concluded with a chorale. Thus, they followed the pattern of reading—meditation—prayer advocated by contemporary Lutheran theologians. Bach’s oratorios, each just under half an hour long, were designed to be performed before the sermon on designated feast days at the three Leipzig churches for which he was responsible. As it happens, we have both the autograph score and the printed text for the first performance of the Christmas Oratorio in 1734. The librettist is unknown, but he may well have been Christian Friedrich Henrici (pseudonym Picander), librettist of the St. Matthew and St. Mark Passions and a master of the art of parody (adapting new texts to existing music), a skill that required musical understanding as well as poetic ability. In fact, the Christmas Oratorio contains numerous movements parodied from Bach’s earlier works, many of them taken over from secular works performed by his student Collegium Musicum in celebration of a specific event such as a royal accession or the birth of a prince. Their texts had become obsolete after a single performance, but Bach wanted to save the music for permanent use. Their elaborate scores and rich instrumentation made them impractical for use on ordinary Sundays, but their dialogues of mythological or allegorical figures could still be adapted within a devotional sequence that was more meditative and contemplative than dramatic. Part I begins with a festive introductory chorus that, in its first incarnation (BWV 214), celebrated the birthday on December 8, 1733, of Maria Josepha, Queen of Poland and Electoress of Saxony. “Tönet ihr Pauken! Erschallet Trompeten” (Sound you drums, ring out you trumpets) has now become “Jauchzet, frohlocket, auf, preiset die Tage” (Celebrate, rejoice, rise up and praise these days). Following the dramatic opening in the timpani, strings and winds introduced the trio of trumpets (Richard Kelley, Paul Perfetti, and Mary-Lynne Bohn), the main protagonists in this genial concerto in lively 3/4 time that juxtaposes trumpets, winds (flutes and oboes), strings, basso continuo ((chamber organ, bassoon, cello, violone), and four-part choir as opposing forces. The following movements followed a double sequence of reading, meditation, prayer, and chorale. Tenor Jonas Budris sang the narrative role of Evangelist throughout the evening with clear articulation and straightforward expressiveness. The meditative recitative, sung with exemplary clarity by alto Margaret Lias, accompanied by two oboe d’amore (Peggy Pearson and Jennifer Slowik) and continuo, was composed after-the-fact to precede the aria “Bereite dich, Zion” (Make ready, Zion) adapted from the secular cantata “Hercules at the Crossroads” from 1733 (BWV 213). In the second section, the recitative that followed the narrative introduction combined lines from a chorale melody in the soprano in 3/4 time with commentary by the bass in 4/4. The aria that followed was again adapted from the cantata for the Queen of Poland. William Prapestis was the resonant bass soloist and Richard Kelley the agile first trumpeter, the two competing from opposite sides of the Emmanuel chancel in a blaze of virtuosity. Obbligato trumpet episodes enhanced the final chorale, recalling the brilliant opening chorus. Part II, for the second day of Christmas, is concerned with the announcement of the birth of Christ to the shepherds. It opens with an instrumental Sinfonia in gentle siciliano rhythm whose opposing forces can be interpreted as antiphonal choirs of angels (strings and flutes) and shepherds (oboe d’amore and da caccia; in other words, alto and tenor oboes). Recitatives by Sarah Yanovitch, soprano, and Paul Guttry, bass, preceded an aria by tenor Frank Kelley, a fine Bach interpreter whose innate musicality was marred by a tendency to hoot in the many demanding roulades. Vanessa Holroyd provided the excellent flute obbligato. Guttry’s recitative, accompanied by the oboe choir, introduced the alto lullaby, “Schlafe, mein Liebster” (Sleep, my most beloved, adapted from “Hercules at the Crossroads”), sung with beautiful phrasing and articulation by Krista River. The most elaborate movement of all was the motet-like chorus of angels “Ehre sei Gott in der Höhe” (Glory be to God on high), which in three sections demonstrated the techniques of passacaglia-like repeated bass, pedal-point harmony, and fugal imitation. Part III, for the Third Day of Christmas, tells of the shepherds going to Bethlehem to worship the Christ child. The instrumentation of the opening chorus is the same as that in Part I, and this chorus is repeated at the end after the concluding chorale. Kristen Watson, soprano, and Dana Whiteside, bass, were beautifully matched in a duet (another adaptation from the “Hercules” cantata) with ritornellos by the two oboe d’amore, Adrian Morejon’s agile bassoon joining the continuo group. “Schließe, mein Herze, dies selige Wunder” (Enclose, my heart, this blessed miracle), is the only newly-composed aria in the entire Christmas Oratorio. Carrie Cheron, the alto soloist, sang with pleasing tone color and emotional conviction, although one might have wished for more incisive German articulation. Heidi Braun-Hill ‘s violin obbligato with its wide-ranging compound melody was one of the evening’s many delights. Although Bach intended Part IV for performance on New Year’s Day, the Feast of the Circumcision, its text does not actually mention the New Year, but focuses instead on the naming of Jesus and his acceptance by the Christian Soul. In the opening chorus, parodied from “Hercules at the Crossroads,” the two horns (Michael Bellofatto and Eli Epstein) alternated caressing and fanfare motives in a rousing duet. Framing the parodied echo aria “Flößt, mein Heiland” (My Savior, does your name instil), Bach devised two duets combining recitative in the bass (David Tinervia) with lines for soprano Kendra Colton from a hymn by Johann Rist “Jesu, du mein liebstes Leben” (Jesus, my dearest life) to his own newly-composed melody. This setting put the parodied echo aria into an entirely new context as a dialogue between the Soul and Christ, with obbligato oboist Peggy Pearson participating in the conversation. The aria “Ich will nur dir zu Ehren leben” (I would live only for your honor) matched Jason McStoots’ ringing tenor with a fine duet by violinists Heidi Braun-Hill and Danielle Maddon. The horns returned in the final chorale with jubilant interjections between the vocal lines. Part V, for the Sunday after New Year, anticipates the first half of the Epiphany Gospel, focusing on the Star guiding the Wise Men from the East. The newly-invented opening chorus calls only for two oboe d’amore in addition to strings and continuo, the two groups playing off one another in lively antiphonal exchange. The chorus then takes the part of the Wise Men, asking “Wo ist der neugeborne König der Juden” (Where is the newborn King of the Jews), a signal for the recitative-style response of the alto soloist, the vibrantly expressive Pamela Dellal, stating that Jesus has already arrived in the hearts of the faithful. The aria “Erleucht auch meine finstre Sinnen” (Illuminate also my dark thoughts), a much-revised adaptation from the celebratory cantata BWV 215, starred David Tinervia, bass, and a wonderful oboe d’amore obbligato by Peggy Pearson. No model is known for the Terzetto, in which the soprano (Kristen Watson) and tenor (Eric Christopher Perry) express their longing for the Savior only to be told, in short and dramatic exclamations by alto Pamela Dellal that he has already arrived (“Schweigt: er ist schon wirklich hier” (Be silent: he is in truth already here!). Trumpets and timpani return in Part VI for the Feast of the Epiphany, which concludes the story of the Wise Men from the East. The opening chorus joyfully celebrated the triumph over Herod’s falsehood in a fugue-like movement in three sections bounded by instrumental ritornellos. After the Evangelist again warned of Herod, soprano Sarah Yanovitch, in an impassioned accompanied recitative, railed at his treachery; her dance-like aria that followed extolled God’s power over man. In the second recitative and aria pair, tenor Charles Blandy delivered a nuanced affirmation of triumph. The opulent scoring of the opening chorus returned for the final chorale, the conclusion of the entire oratorio. Here the chorale melody, sung line by line by the sopranos and harmonized by the lower parts, was enhanced by instrumental interludes that highlighted a soaring first trumpet part delivered with virtuosic panache by Richard Kelley. 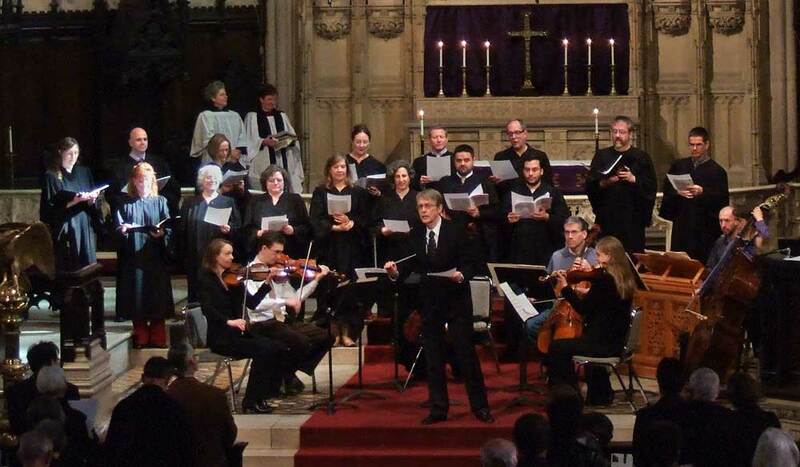 Founded by Craig Smith and continued after his death by John Harbison, and since 2010, by Ryan Turner, Emmanuel Music has nurtured outstanding singers and instrumentalists, composers and conductors with busy careers who keep coming back to take part in its regular Sunday cantatas and in its many other performing activities. Their loyalty certainly contributes to the cohesion that seems to infect Emmanuel performers and audience alike. Ryan Turner, a talented and energetic conductor has maintained its tradition while seeking out new directions. Thus, we have a musical institution we can all salute. What a well-written, fair, and comprehensive review this is. Well done! If you weren’t at Emmanuel Church Saturday evening, you were in the wrong place. This was sublime music by the Master of Masters performed and sung magnificently. It was a thrilling experience, as was their St. Matthew Passion some months ago. While the singing was at a very high level (it seems to this listener that the level of singing is improving) I would like to make special mention of Sarah Yanovitch. This young woman has been given a voice of rare beauty and she has the musical sensibilities and training to use it to tremendous effect. There were moments when she reminded me of Elisabeth Schwarzkopf; it would be hard to pay her a greater compliment.